AnchorSentinel is free, open-source and is licensed under the GPL. And there are no ads. 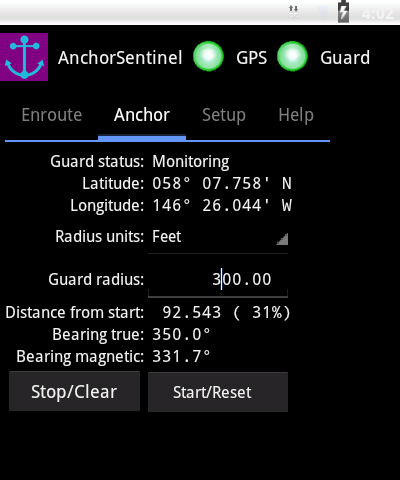 AnchorSentinel requires Android version 3.2, API 13, or newer. AnchorSentinel is a nautical program with three primary purposes: It provides an accurate position, speed and bearing (true and magnetic) while underway, it stands sentinel against anchor drag while at anchor, and it provides an arrival alarm for a specified travel distance. AnchorSentinel relies on the fact that most Android devices have a built-in GPS receiver able to determine its position within a few meters, adequate accuracy for AnchorSentinel's purpose. For boaters who haven't been in dangerous situations, or who don't anchor very much, I should say that an anchor watch is a very good idea, and an Android device is an ideal platform for this task because it requires very little power, it operates independently of the boat's primary navigation and power systems, and it provides a secondary source of accurate position information in an emergency. I wrote AnchorSentinel after being in a very dangerous fix in Alaska a few years ago, a story told in detail here. Exhausted after a long, rough crossing, I anchored in a windy bay and dropped anchor, not realizing my anchor chain had gotten tangled during the day's rough conditions and didn't extended to an adequate length when I released it. Then, too tired to exercise good judgment, I fell asleep without setting an anchor watch. By morning I was high and dry on the shore, 18 feet from the nearest water, in bear country. During my three decades of sailing I've sailed solo around the world, I've been in any number of stupid anchoring situations, but that episode was by far the worst and most dangerous. And I could have avoided it by setting an anchor watch. That's why I wrote AnchorSentinel. 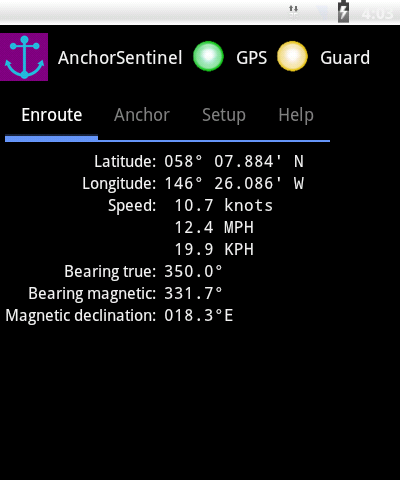 Now my Android device sits on my chart table, gives me an accurate GPS position, speed and bearing while underway, and stands sentinel against anchor drag when I'm anchored. And unlike my primary boat navigation system, my Android device doesn't require a significant amount of power, so I don't have to worry about exhausting my boat's batteries by leaving my device running day and night. Detailed documentation is provided with AnchorSentinel. I've written and tested AnchorSentinel to the best of my abilities, but users of this program should not rely solely on it, or any single source of navigation information, when property or safety are at stake. AnchorSentinel is distributed in the hope that it will be useful, but without any warranty; without even the implied warranty of merchantability or fitness for a particular purpose. See the GNU General Public License for more details. Hello — I'm Paul Lutus, author of AnchorSentinel. I've been writing software for about 35 years and have written some very well-known titles (Apple Writer, Arachnophilia). I wrote AnchorSentinel because there were no Android programs that could give me what I needed. Existing programs were missing features that I regarded as essential, like a simple, intuitive interface and the ability to function without using my boat's primary GPS system. I hope you like AnchorSentinel. And stay tuned — I'll be writing more Android programs in the future. The easiest way to get AnchorSentinel is to visit the Google Play Store's AnchorSentinel page — this method is secure and it checks for compatibility with your Android device. The next-easiest way to get AnchorSentinel from a camera-equipped Android device is to take a picture of the QR code at the top of this page and download the result. 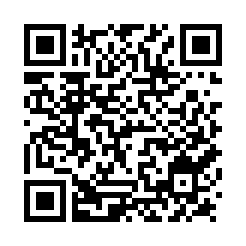 The next-next-easiest way is to click the download link that appears below the QR code. This only works if you are browsing with your Android device. Another way is to use another computer to download the AnchorSentinel file, then download it onto your Android device. Programmers: AnchorSentinel is open-source and licensed under the GPL. Click here to download the source archive. Even though AnchorSentinel comes with detailed documentation, it should be relatively easy to use without instructions. The AnchorSentinel underway functions automatically start with the program, providing velocity in knots, KPH and MPH, true and magnetic bearing and magnetic declination at the device's location. The AnchorSentinel anchor watch function is activated and/or reset with a simple press. Customizing the guard radius is very easy. The AnchorSentinel setup functions allow the user to customize the spoken alarm messages and configure the data displays. AnchorSentinel is free, it doesn't show ads, it's not crippleware or shareware, and I don't want your money. I just thought I would make that clear up front. 08.02.2018 Version 1.5. Changed minimum SDK to 13, correcting an error. 08.02.2018 Version 1.4. Updated SDK target version to 26, a recent Google requirement. 05.14.2014 Version 1.3. Replaced the magnetic declination computation code for greater accuracy, updated help page. 04.28.2014 Version 1.2. Changed layout and added scrolling for small displays, fixed an interim velocity display bug, added readouts to anchor watch display, cleaned up some small issues. 07.08.2013 Version 1.1. Improved the wake-from-standby code, added more display options. 06.12.2013 Version 1.0. Initial public release.